23 April 2016 In London recently, I sat through a public panel discussion between a mainland-born Chinese artist and a British curator, held for the benefit of those interested in investing in the Chinese art market. The curator repeatedly urged the artist to recount his childhood growing up during the Cultural Revolution, ignoring his increasingly apparent reluctance to talk about it. The exchange was indicative of how often in the Western art world Chineseness is subjected to the worst kind of essentialist reduction to narratives of suffering, struggle and redemption. Consider this: for those who have journeyed from Greater China to the UK – whether passing through or in a bid to find new ways of living here – will they and their descendants forever be fated to continue being Chinese? Is their Chineseness something they ought to resist? These are the core questions that have driven the work of Manchester’s Centre for Chinese Contemporary Art (CFCCA), which celebrates its 30th anniversary this year. CFCCA is a primary venue for artists of Chinese descent practising in the UK and, over the past three decades, it has responded both to the economic-cultural ascendancy of mainland China and to the many changing meanings of ‘British Chinese’ art. The CFCCA opened its anniversary-year programme in 2016 with ‘RareKind China’, a project that draws together street artists from the Greater China region and the UK. In this exhibition, spray-painted images of mutant catfish jostle for space with crazed architectural visions, spilling out of the gallery and onto the walls of Manchester’s Northern Quarter itself. In Stevenson Square, a strong likeness of the Hong Kong Chief Executive CY Leung – the unapologetic target of 2014’s explosive pro-democracy demonstrations – has materialized, splashed out in anarchic red and black by the Hong Kong graffiti artist Uncle. The incongruous appearance of this piece of Chinese protest art within the square reflects the site’s own deeper history as a place of 19th-century rallies throughout the Chartist movement. Standing there, I sensed what it might mean to live between worlds, a feeling of hybridity that the CFCCA’s projects have captured brilliantly. When I first wandered into the Centre eight years ago, they were showing Hong Kong-born British artist Suki Chan’s epic video installation Interval II (2008), which splices sweeping time-lapse footage of a cast-iron pier in northern Britain with images of light filtering through an earthen roundhouse in southern China, layered over with audio fragments of Chan’s grandmother singing traditional Hakka music. The uncertain effect it produces ­– of being between ‘the West’ and ‘the rest’ – is a theme the CFCCA’s curators have often returned to in order to reflect on the transient, migrant or diasporic relationships between the UK and China. The Centre began as a small cultural festival in Manchester’s Chinatown in 1986. Much of the initial impulse behind its founding came from British Chinese artists’ relative exclusion from the radical black arts movement, inspired by the cultural theorist Stuart Hall, which shook up UK cultural life in the 1980s and called for the decolonization of the country’s major artistic institutions. Outside of the tumult of black-white relations, British Chinese artists sought ways to rework and rearticulate Chineseness in the face of a mainland China that always threatened to enforce its geopolitical ‘authenticity’ upon them. And nowhere have artists pursued this more vigorously than in the visual politics of food. Prints by the illustrator Stanley Chow, taken from his ‘inStanGram’ series (2016), cover one of the CFCCA’s back walls. This follows his 2014 retrospective at the Centre, ‘The Takeaway’, which transformed the gallery’s window into a shop front that recalled Chow’s experiences growing up above a Manchester chip shop run by his parents, who had emigrated from Hong Kong in the 1960s. With ‘inStanGram’, Chow playfully mimics the colour saturation and interface of Instagram in portraits of food that carry deep associations for him: a tray of luminous egg tarts from Chinatown, a rack of chestnut roast ducks, a gleaming copper rice cooker the artist has carted round from Swindon to Chorlton. This focus on the ways food can powerfully recall cultural or familial bonds – as well as social conflicts – has also been an important tradition for long-standing CFCCA stalwart Anthony Key, whose work breaks down the culinary stereotypes of Chineseness by repeating them obsessively. In 1996, Key showed Soy/Ketchup: a bottle of Heinz ketchup filled with black soy sauce. Not only does the piece suggest an anxiety over the commercialization of identity, but also the feeling of cultural ambiguity that arises from being caught between worlds. Has the ketchup bottle been corrupted by a viral fluid? Or is Key thinking not about what the bottle might be or has been but, instead, imagining what new identity it can assume? ‘It’s a big step for the local population to eat foreign food,’ Key observed in a 2007 interview. ‘It’s actually putting something unfamiliar into your body and that’s a major physical and psychological threshold. I think that boundaries, the inside and the outside, can also represent national borders.’ In Free Delivery (1999), he brought his humorous critique to bear on the premise of ‘assimilation’: a map of the UK consumed by red pennants bearing the names of Chinese restaurants. It is a landscape in which invading hordes of local takeaways converge with the threat of ‘the yellow peril’. Another figure returning to the CFCCA, British-born Chinese artist Gordon Cheung, suggests that Chineseness in the West may be a marker both of marginalization and of economic privilege. 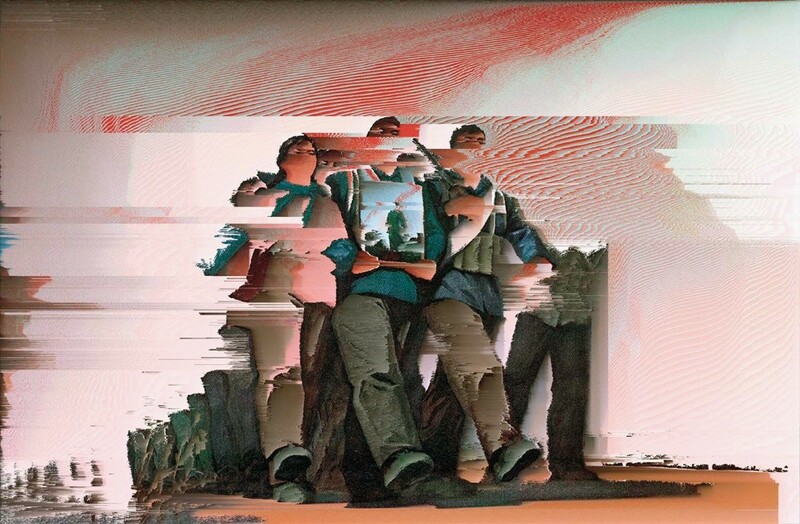 In 2008, the Centre showcased Cheung’s Death by a Thousand Cuts – vast murals of spray paint layered on stock listings taken from the Financial Times. These became hallucinatory testaments to China’s ascent to global superpower status, as well as to consequent Western fears. But there is, perhaps, another anxiety at play here: the worry that British Chinese artists no longer hold enough stake in Chineseness to gain a footing in the international art market, compared to their counterparts from the Chinese mainland. Closing the CFCCA’s anniversary season is British-born artist susan pui san lok, a key figure in the art community that has grown up near the Centre. Her martial arts-inspired video installation, RoCH Fans and Legends (2016), drawing on the classic 1950s wuxia novels of Hong Kong writer Louis Cha, will take over the gallery space in June. pui san lok, whose parents arrived in the UK from Hong Kong in the 1960s, explores personal identity in her multimedia installations. In 2003, she showed her video Notes on Return, which featured a sound recording of the artist and her parents reciting a poem by the exiled poet Bei Dao – first in Cantonese, then in English. Initially, their voices stumble over each other but, gradually, their rhythms begin to converge in a natural harmony. What does ‘Chinese’ mean as an artistic category in Britain? The migrant intellectual Ien Ang is clear: ‘If I am inescapably Chinese by descent, I am only sometimes Chinese byconsent.’ Who calls the shots over what Chineseness entails, at any given moment, is profoundly political. It’s a necessary fiction – a kind of strategy that risks losing it all in essentialism, but that also offers opportunities to disrupt dominant narratives of identity.